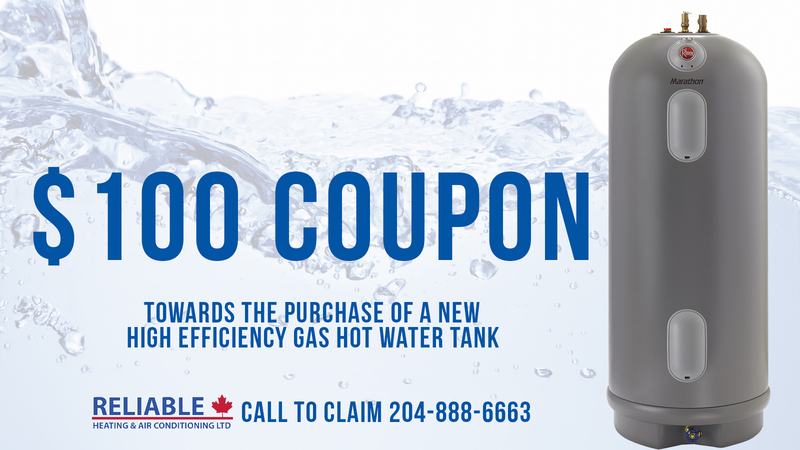 Due to the recent changes in the gas codes, 90% of homes in Winnipeg will not be able use a standard gas hot water tank anymore because most homes have high efficient furnaces installed, and the tanks are not drafting properly due to over-sized chimneys. This gives homeowners the opportunity to upgrade to high efficiency! Installing a high efficiency Rheem hot water tank not only qualifies you for the low interest loan from Manitoba Hydro, it will help make your payments for you. Running high efficient compared to electric will save you approximately $20 per month. The tank will pay for itself and is an upgrade in your home! If you are selling your home or looking for a less expensive option, switching to electric is another option. So give the professionals at Reliable Heating a call (204-888-6663) and we will send one of our experts out to give you a free estimate.